When you think of iconic cities, most people get images of notable landmarks, buildings, and skylines. London has Big Ben, Paris has the Eiffel Tower, New York has the Empire State, LA has those cheap sheet metal letters that spell Hollywood. But there's distinctive mobile landmarks as well — the distinctive cars of cities. Cars do a lot to define the overal atmosphere of a city. If (I mean when) I find myself waking up in a dumpster in some random city, the cars would be the first big clue as to where I was. 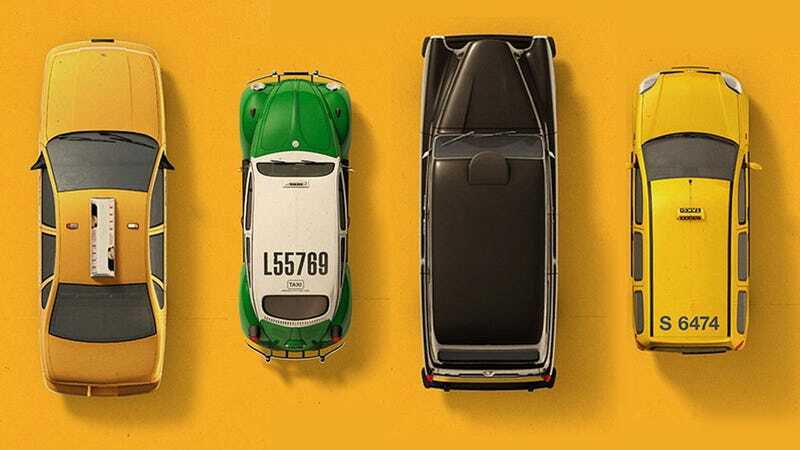 Think about distinctive cab fleets — New York was known for its Checkers, then its Crown Vics, Mexico City has its green Beetles, London has black cabs so iconic, new ones are made to echo the look of the old. Cars don't last as long as buildings, generally, and with the first century of motor transport now behind us, we find that the cars that have come to define the look of a given city in a given era — 2CVs and Renault 4s in Paris in the 60s and 70s, Minis in the London, and so on — are rapidly becoming more and more rare. Sure, new cars will come to replace them, but does a city have an obligation to keep their motor heritage alive, like they do with historic buildings? As impressed with myself as I was, I'm not the first to consider this. Generally, I should probably remember that I'm always more impressed with my Big Ideas before I spend some time on Google. The merits of a Historic Register for car has been debated by the New York Times, our pals over at The Truth About Cars, and there's even a group dedicated to this sort of automotive recognition and preservation. However, what has yet to happen is anyone to exactly figure out how this would all go down. The National Register For Historic Places in the US already allows for cars to be registered, under their "object" classification. And while that's fine, the goals and methods of a historically registered vehicle need clarification. First, there's the why: why should we have a register of historic vehicles? I think the best reason is from a preservation standpoint. It would be an acknowledgement that the car-scape of a given area is important, and at least some historic vehicles should be preserved. Perhaps there could be means for a city itself to maintain a small fleet of historically significant vehicles that contributed to the history and character of the city. For example, it seems that New York should have a couple of well-preserved Checker cabs in its possession, because that city owes a great deal to those now-rare cars. Such a register could offer help and support to private owners of significant, vintage vehicles as well, much in the same way owners of historically registered buildings are today. In exchange for, say tax breaks or subsidized maintenance or something similar, there would likely need to be criteria in place to keep the cars authentic to their time, again, just like is done for buildings. No swapping a hybrid drivetrain into that Hupmobile or anything like that. There will always be people who want to restore and modify old cars any way they want, and that would need to be left alone and able to thrive as well. There's value to someone shoehorning in a modern LS1 into an old Corvair or making an electric Toronado as well, and while those sorts of cars likely wouldn't be part of any historic register, I wouldn't want anything that hindered people's freedom to make really bonkers cars. That said, if someone has one of the few surviving Davis cars out there, for example, should there be any protections in place to keep that car in its original specification? If, let's say, there were only 3 Davises left on Earth, and someone bought one with the goal of adding a fourth wheel and putting a Prius drivetrain in there, should that car be protected under some sort of historical preservation law? There's a tradeoff between history and freedom that would need to be made, and it's not an easy choice. I'd lean to saying that in cases of extreme rarity, history takes precedence. There's lots of other cars available to do crazy things with. I think maybe an interesting solution would be for a city to select a number of cars that are especially important to that particular cities' character, and focus on those. This won't be an easy decision, but I think keeping a tighter focus that's unique to a given area will help make such a project manageable. Let's use London as an example. I'd say the Black Cabs and original Minis are the absolute essentials, and maybe the old police Wolselely. Private people who own these could petition the Historic Car Register for assistance in restoration and preservation, and in return the city could call on these cars to be used for events, parades, photography, etc. The cars would be, essentially, driving landmarks of the city. Not every city has iconic cars associated with them, but many do, all over the world. Mumbai would preserve its Hindustan Ambassadors, Tokyo its early Kei cars, LA its 80s-era Mercedes SL convertibles. I'm sure there would be well-preserved examples of these regardless, but having an actual register gives the cars the same status that architecture has enjoyed for decades, and that recognition is important. Now I have to start lobbying the Los Angeles city council that my '73 Beetle is a landmark they need to preserve.